When I was growing up, Thanksgiving was all about family. If we were stationed overseas, my Mom cooked the meal for our little family of four. When we were in Indiana, we ate at the smorgasbord that was Grandma & Grandpa's house, sometimes even joining the larger family of my Grandma's siblings for another meal. As I reflect today on Thanksgivings past, I realize I haven't had one of those large family gatherings in years due to my Army assignments... and I don't know if I ever will again. Without my Grandma, the glue that held the family together, other things seem to get in the way of everyone getting together now. There is no magnet to draw us all in, which is incredibly sad to me, especially since most of the family lives within an easy driving distance of each other. I suppose it's only natural that we give up the big parties with tons of cousins and aunt and uncles. We draw closer our nuclear families... which for me, is something I have always had as a constant in my life. Someday, my sister and I will have kids of our own to increase the numbers, increase the joy. Last year, I was in Iraq for Thanksgiving. 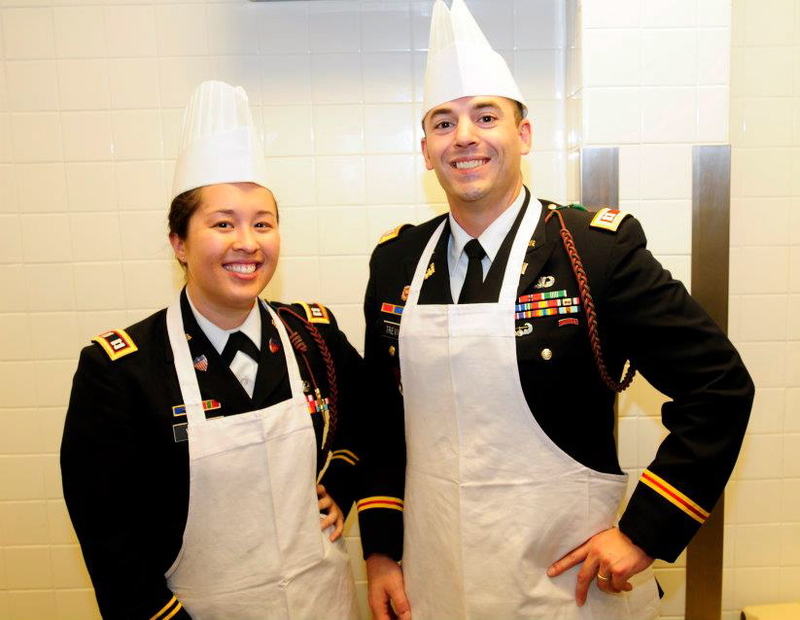 I served the troops at our dining facility, and it was a really happy time despite being so far from home. I think that most people, including my own friends and family, have no idea what it's like to spend a holiday so far away from 'home' in such an austere, unfriendly environment. They may never know what it is like to feel that vacancy, that void... and maybe that's why things like Thanksgiving meals with family are taken for granted. This year, I served (in another funny hat!) 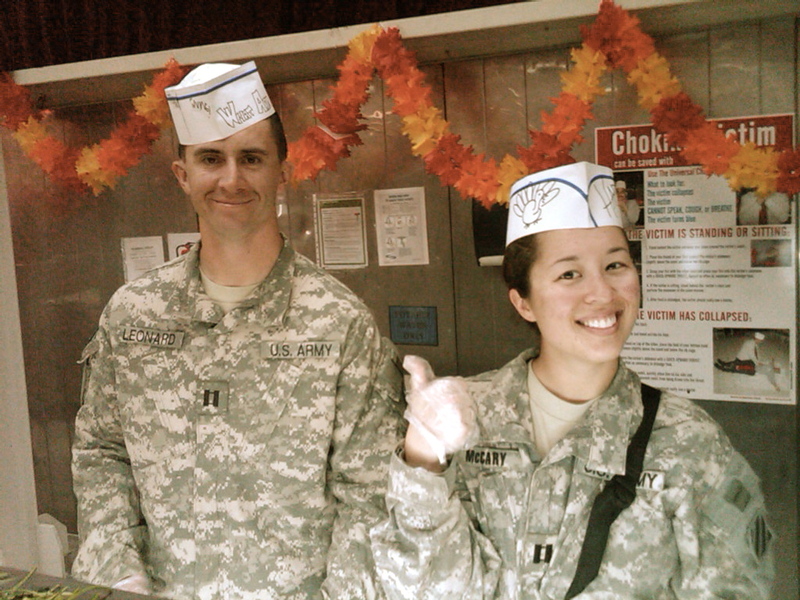 again at our dining facility, for tons of soldiers eating a Thanksgiving fare for lunch yesterday. It's a moving experience to share that with so many people, and I'm so glad that local families take them into their homes if the soldiers cannot leave for the holiday. When I think about what I'm thankful for, I realize that I am an incredibly fortunate girl. I have parents who are incredibly supportive and loving towards me. I have a sister who makes me laugh and will always be there for me no matter what. I have friends who have helped me survive the worst things in life, especially these past two rough years. I am so optimistic and hopeful for the future, starting a new chapter in my life, and moving forward. 2012 is going to be my year, but I am thankful to have gotten to this point and to have the best company in life a girl could ask for.